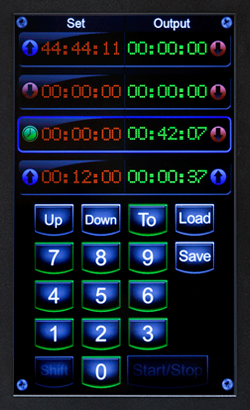 The IDS Production Timer forms part of our centralised IP-based information and control system. It provides users with a familiar yet fully customisable interface including all the traditional Up, Down and To functionality, enhanced by a progression of displays to make the operation more intuitive. It does all of this using a single ergonomic desktop IDS touchscreen, which not only reduces the footprint on technical desks and stacks, but also lowers the whole of life cost by reducing the number of separate systems that need to be purchased and maintained. By implementing an IDS touchscreen instead of separate controller hardware, operating an IDS Production Timer is faster and more intuitive than other designs. The system guides users through timer operations by highlighting the specific controls required for each stage. The touch screen on the left shows that Timer 2 has been selected and now requires the user to select a mode of operation which is communicated to them by enabling only the Up, Down, To and Load options. The screen on the right shows that the count To function has been selected and the software responds by enabling the numeric keypad so that a time can be entered. Once entered, this can then either be loaded 'Load' into the unit's memory and is displayed in the left hand 'Set' column (shown red) ready to begin. Or saved 'Save' as 1 of 20 pre-sets (per timer) that can then be later recalled and started from the keypad or by an external GPI trigger. The final step is to select 'Start/Stop' as required. The righthand column then shows the active timer count (in green). The same steps may be repeated for each of the four timers. For the addition or subtraction of time for an existing or running count, the required timer selected, followed by '+' or '-', followed by entering the required time with the keypad. The operation is then actioned by selecting 'Start/Stop'. As an alternative to entering a specific time, '+' and '-' can be used to increase/decrease the time in seconds. In the example above, the traditional Leitch desktop unit is replaced by an IDS Touchscreen with optional 24 key tactile keypad. Typically, the timer module will form one in a series of tabs or pages on the touchscreen. 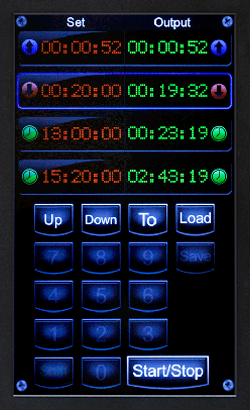 Other tabs may include a user's personal time of day clock and tally lights, offset time controls to allow the user to apply a temporary new time to selected clocks during pre-records, IR remote controls of TVs and STBs, DMX lighting pre-set controls, IP CCTV camera selection, screen branding selection or pre-set screen layout selection. A duplicate of the first two timer counts is distributed across the network and displayed on a screen via an IDS Remora display processor, along with TOD clock (referring to a NTP time server), and an ON-AIR signal indicators triggered from an external GPI via the IDS SQ-GPIO3 interface. As IDS is a networked platform, any information created or controlled from the touchscreen can then be configured to be displayed on any other display device on the network. IDS can work across multiple VLANs meaning that it is not just limited to a local studio or even a single building. IDS is shown interfaced to external systems using an SQ-GPIO3 which offers 3 opto inputs and 3 relay outputs, connected to the IDS network via a power over ethernet (PoE) port. As an alternative, the IDS SQuid (SQ3) offers 32 GPIs, 32 relays and is housed in a 1RU 19" case with dual hot-plug PSUs. For many years, the standard broadcast industry production timer was the Leitch (later Harris) UDT5700 desktop unit or the 19" rack mount UDT5701. Existing Leitch timer units can still be used with IDS. 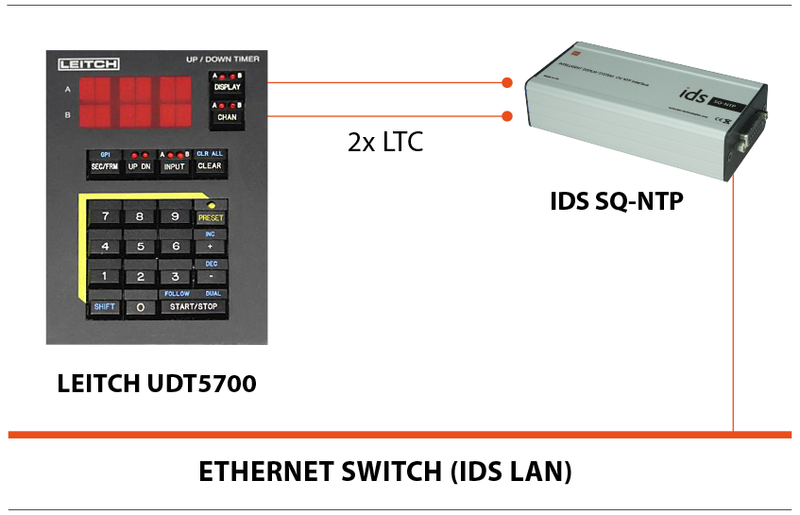 Rather than using the IDS touchscreen an IDS SQ-DTC interface can be used which takes the two LTC outputs from the UDT5700 and converts them into IDS for distribution across the IDS network.